Here from Convention Central in Marietta, OH and Williamstown, WV. 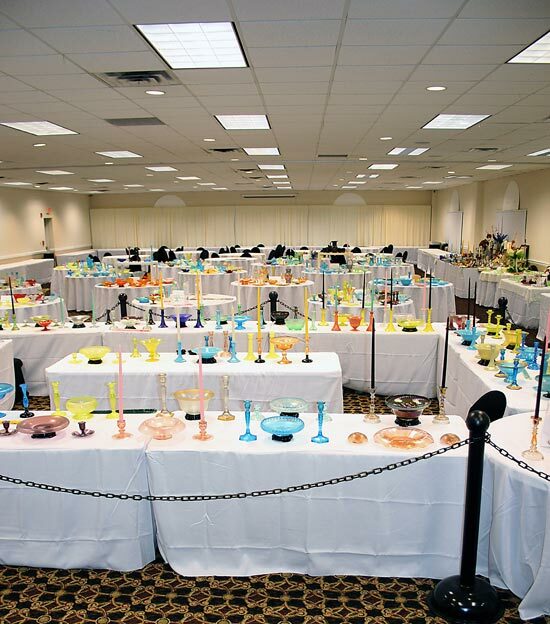 — last week we had the 42nd Annual Stretch Glass Society Convention, Show & Sale on Wednesday, Thursday and Friday. 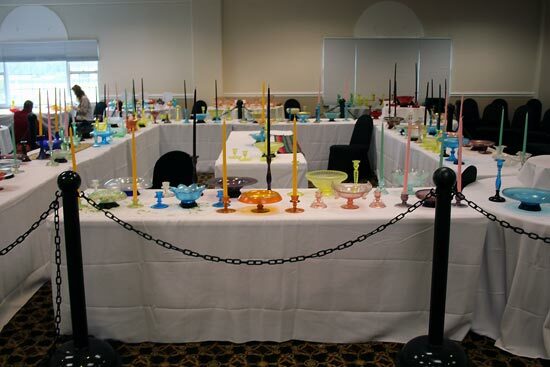 The National Fenton Glass Society’s convention began on Saturday and concluded on Monday night. 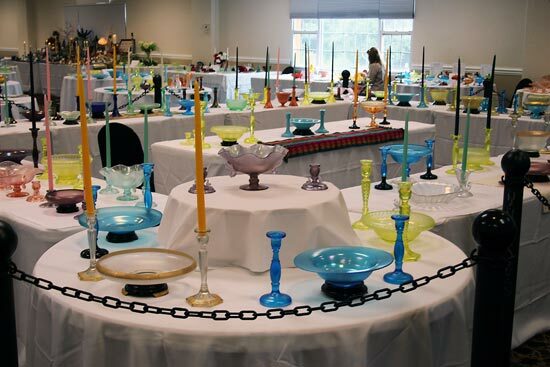 Today (Tuesday) the Fenton Art Glass Collectors of America’s convention kicked off and it will continue for the next couple of days. As you can imagine, there has been a lot of glass here on display and for sale. The Stretch Glass Society, which displays and sells stretch glass all in the same room, had over 250 pieces of stretch glass on display and at least another 250 pieces for sale. 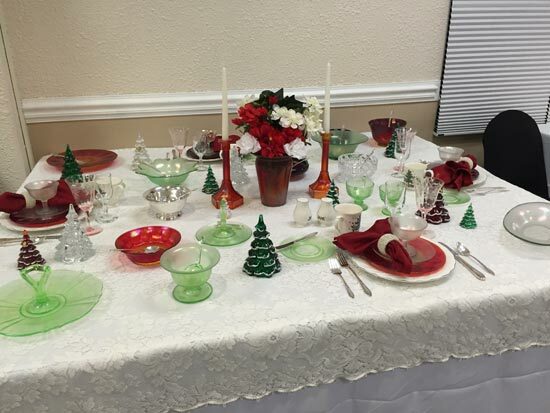 Our club display – a collaborative effort by SGS members – featured 50 console sets from 8 of the 9 companies which made stretch glass (Jeanette did not make any stretch glass candleholders, so they were not represented in the display). Here are some photos of the club display. Many pieces of stretch glass were bought and sold during the convention, both in the convention room and by those who were buying/selling in individual hotel rooms. Tomorrow, I will share some of these wonderful pieces with you. But for now, here's some descriptions to get you excited for tomorrow's pictures. A basket with light crystal iridescence; we believe this to have been made by Imperial and would appreciate any help confirming (or denying) that. A celeste blue Fenton tumble up. This one is unusual due to the rings on the bottle and the ring on the tumbler. A beautiful, deep Fenton cobalt blue bowl with great color. A US Glass Nile Green slag glass vase; as usual, the iridescence is light and primarily only on the inside, but it is a tough piece to find and got quite a bit of attention. There are many other pieces which you will no doubt hear about on future Tuesdays. 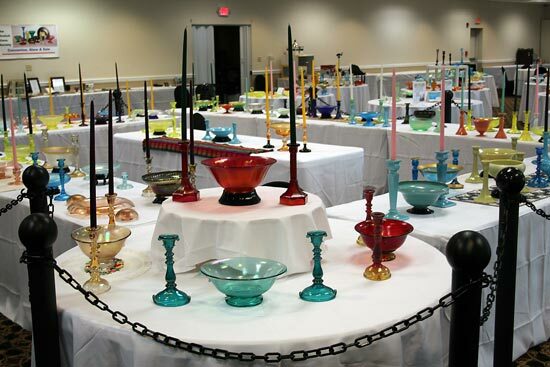 The SGS auction, by Tom Burns, included a large collection of Dancing Ladies vases and bowls in many colors and finishes, including one vase with a hint of Persian pearl iridescence, plus a nice selection of stretch glass. I was able to add to my 1 Dancing Ladies vase sufficiently so as to be able to say that I now have a collection of them! 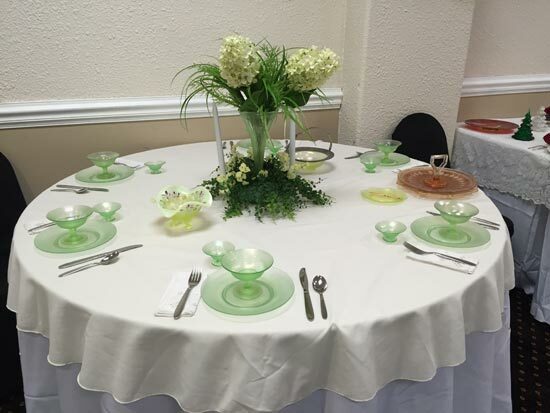 As usual our convention had several seminars including one by George and Nancy Fenton on contemporary stretch glass. 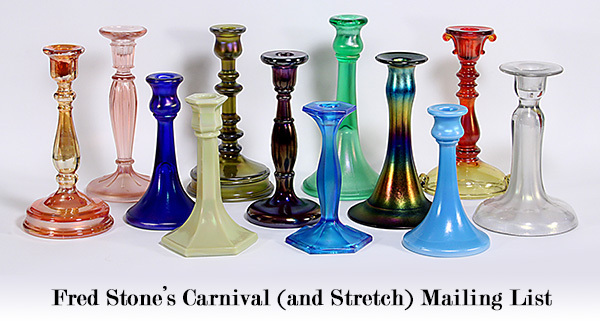 They put together a very educational presentation on many of the Fenton “collections” of stretch glass which were marketed in the contemporary period. 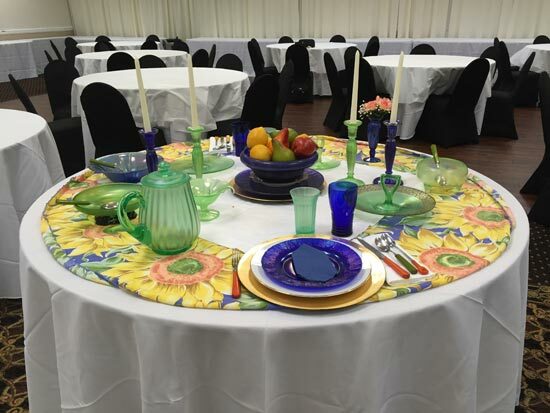 And, as you can see in these photos, several of our members had outstanding display tables portraying how they use their stretch glass to entertain at home.